Along several blocks of varyingly restored Victorian buildings, now housing a collection of drug and discount clothing stores, you can detect hints of the area’s elegant past. 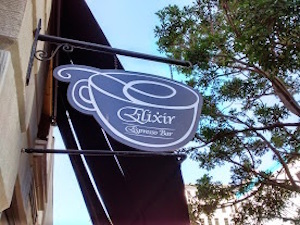 Through an iconic arched entryway the Elixir Espresso Bar occupies the lobby of the beautifully restored Marston Building (1896 neoclassical, originally the stylish Marston Family Department Store). Framed photos of the building in its glory days contrast the black and white past with the technicolor present, and the wrought iron cage elevator adds to the vintage flavor. This very reasonably priced café, serving locally roasted Caffe Calabria coffee and the most delicious crepes this side of the Seine, also features coffee drinks of every stripe (all coffees are also available iced) as well as six flavors of gelato and polite and efficient service. Inside seating is limited but there are several street-side umbrella tables as well as two sidewalk carry-out windows through which you can order and watch the creation of your light lunch or afternoon snack. Savory dishes include a breakfast crepe with scrambled egg, a generous handful of Monterey Jack cheese, and chunks of ham ($5.25) and a turkey crepe with Monterey Jack cheese and fresh baby spinach ($5.25). Those seeking a little something sweet with their latte will swoon over the best-selling Yummy Yummy crepe, filled with slices of fresh banana and chopped strawberries, a decadent drizzle of Nutella, and a light sprinkling of powdered sugar ($6.25).